When distant stars explode into supernovae or when remote galaxies collide, it takes time for news of these events to reach us. Signals can only travel at the speed of light, and when an event occurs at cosmological distances, it can be millions or even billions of years before we see it here on Earth. In other words, the farther we look into space, the farther back in time we see. If we cast our gaze as far as possible, we see ever older and more distant sources of light. However, we never see an edge to the Universe. Instead, we see a beginning, a wall of fire that blocks signals from a younger Universe. This is the oldest light in the cosmos, and it reveals the hot, dense plasma that permeated space for the first few hundred thousand years following the Big Bang. This is the Cosmic Microwave Background (CMB), and it gives us a glimpse of a Universe long past. The CMB lets us study the Universe at a simpler time in its history, a time before galaxies and stars, before planets and people. Using microwave instruments like the Atacama Cosmology Telescope, the South Pole Telescope, or the balloon-borne SPIDER, we study this early Universe, and learn about both our origins and our future. 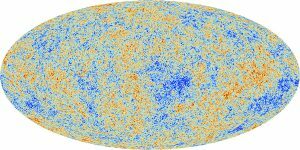 The CMB is the lynchpin to our current models of cosmology, first as proof of the Big Bang model; later to motivate the inflationary period in the first instants of existence; and more recently elucidating both the existence and properties of Dark Matter; and even providing independent measurements of Dark Energy. Modern studies of the CMB aim for ever more precise measurements of its various properties. Some search for characteristic patterns left by gravitational waves sourced during inflation, while others examine the subtle twisting and distortions left by gravitational lensing by intervening matter such as distant clusters of galaxies.